Temperature and rainfall are the two most important things for forests. Many places are too cold or too dry for them. Forests can exist from the equator to near the polar regions, but different climates have different kinds of forests. In cold climates conifers dominate, but in temperate and tropical climates forests are mainly made up of flowering plants. Different rainfall also makes different kinds of forest. No forests exist in deserts, just a few trees in places where their roots can get at some underground water. Evergreen is coniferous forests stretch across Canada, Alaska, Northern Asia, and Northern Europe. They are composed of conifers which produce seeds in cones. The weather during the winter is cold, but when snow melts in the spring, some parts of the forest become swamps. There are not many different types of trees in coniferous forests because of the cold weather, and the poor soil. Fallen branches, needles, and dead animals do not decay as fast as in warmer regions. This is why the soil in coniferous forests is not very fertile. Also, only those trees that have adapted to cold weather and poor soil can survive. These trees have flexible branches that support heavy snowfalls. Less water evaporates from their leaves because of the shape of their needles. Many coniferous trees shade large parts of the soil below them, which keeps many plants from growing on the forest ground. Some animals that live in the coniferous forests are pine martens, deer, bears, caribou, moose, lynes, heavers, and birds such as grey owls, crossbills, and marblers. 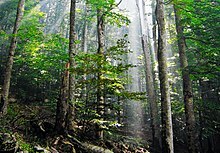 Deciduous forests mostly grow in the temperate zone of North America, Europe and Asia. They have a moderate climate during the spring, summer, autumn (fall) and winter, with rainfall of at least 500mm a year. Summers are warm and winters are cold, but not as cold as the northern coniferous forests. In the winter, snow covers the ground and the deciduous trees and plants lose their leaves. The decaying leaves help make the soil rich in nutrients. Many insects, spiders, snails, and worms make their homes in this rich soil. Wild flowers and ferns grow almost everywhere in the spring. New leaves capture the energy of the sun and sprout before the tall trees shadow them. Some deciduous forests grow in tropical places that do not have a winter but do have a wet season and a dry season. 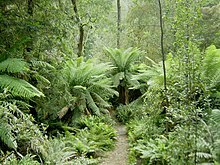 Tropical rainforests grow in South America, the Congo, Indonesia and some nearby countries, Hawaii, and eastern Australia. Tropical rainforests are aptly named, as it rains here on about half the days. 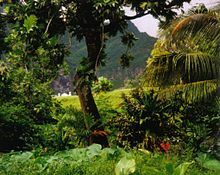 The only season in a tropical rain forest is summer, so plants grow for all 12 months of the year. Trees are tall and thick in the rain forest and they grow so close together that they seem to form a big umbrella of greenery called a canopy. This blocks out most of the sunlight. The air is muggy as it filters through the dense canopy cover of the trees. The light that filters through this tree cover is dim and green. Only along river banks and in places that have been cleared does enough sunlight allow plants to grow on the forest ground. Millions of species of plants and animals live in the world's tropical forests. Life in the rain forest exists at different levels or layers in the trees. 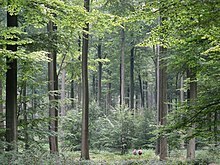 Each layer has a name, such as 'emergent', 'canopy', 'understory', and 'forest floor. Animal life is found on all levels. ↑ In a deciduous forest there are alway places where the sunlight reaches the ground. This page was last changed on 27 February 2019, at 12:00.